Raycom Media, the privately owned broadcasting company with local TV stations in 44 markets, is using CrowdTangle to expand the social media acumen of their entire organization. By using the tool to monitor station social media performance and drive internal conversations and spread best practices, CrowdTangle is defining how Raycom’s corporate leaders direct station management on social media strategy. Among the users of CrowdTangle at Raycom: anchors, reporters, producers, assignment managers, news directors, general managers and every member of the digital team. “Being able to find your way around CrowdTangle is now a requirement of our digital producers and managers,” Brad says. On a daily basis, Brad works with Raycom’s stations on their social performance. He says he uses every facet of CrowdTangle to help stations communicate better with their social audience. CrowdTangle’s weekly leaderboard report — based off a custom list that monitors page-level interactions and growth for the more than 40 stations — is one of Brad’s most used features. The weekly leaderboard provides a big picture look at the data so he can have informed conversations and dig into page activity for the week, he says. The digital director for WMC Action News 5 in Memphis, Tenn., Kelsey Jacobson, says she studied CrowdTangle data to inform how she positioned a popular story across social media. 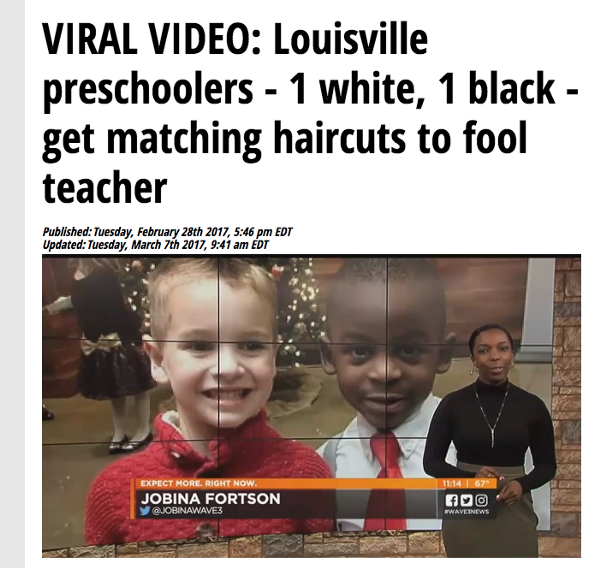 The story was about two boys of different races who got the same haircut in order to fool their teacher. 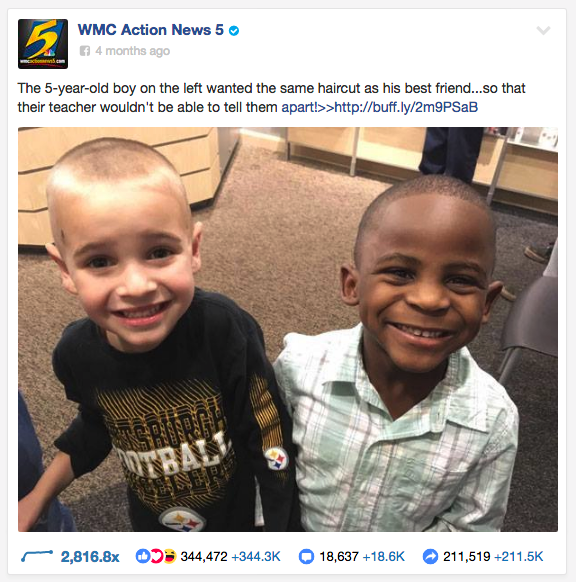 It was an original story produced by WMC’s sister station WAVE in Louisville, Ky.
“My team shared the story — but the boy hadn’t actually gotten his hair cut yet. [The post] didn’t do well because the photos used in that story didn’t make sense, since they had two totally different haircuts,” Kelsey says. Kelsey says the team eventually saw the new story doing well in CrowdTangle among their stations. She used CrowdTangle to study how the other stations positioned the story and decided to share it as a photo post with a link in the status copy to feature the new photo. CrowdTangle data indicated the post overperformed by 2,816x the average of WMC’s Facebook page and still remains the top post for total interactions, more than 574k, since it was posted on March 1, 2017. Brad says of all CrowdTangle’s features, they use notifications the most at Raycom. In their CrowdTangle account, Raycom has set up a custom list of all their anchor talent for sports, weather, news, et al. as well as market competitor lists for each station. These are synced to a monthly leaderboard notification that goes out to all station GMs and “top brass” in the company. Glen Hale, Raycom’s executive director of digital content, says this has created a friendly competition among stations and talent to drive the right strategies. Brad says most of Raycom’s stations have set up multiple email notifications that go out to members of their newsroom and, in some cases, the station’s business-side colleagues. Glen says some Raycom newsrooms are are also taking charge and creating visual “End of the Week” reports based on CrowdTangle data that show top news performers in their markets. By monitoring stations through CrowdTangle’s notifications and leaderboard features, Raycom has been able to develop best practices they share throughout their owned and operated stations. For a long time, Brad and his team studied underperforming posts to tell stations a story of what their audience didn’t care about. He says it changed how some stations were posting. “Being able to show posts that aren’t working makes it very clear,” Brad says. Glen adds that CrowdTangle shows their team at HQ which digital leaders at the company are able to grasp best practices and put them into action. He says the tool has been helpful with reinforcing their staffing decisions, based on how well folks adapt to the learnings it provides. CrowdTangle allows Brad’s team to passively create buy-in around Raycom’s social media strategy. At WMC, Kelsey says CrowdTangle is an integral part of her workflow for generating story leads and monitoring her station’s performance. “CrowdTangle helps me understand where our talent and station pages stand, what is working for us, and what could be done better,” she says. “It’s great to see what is working well for others and determining whether that could work for us to drive engagement on our social media networks. It’s also a motivator knowing where we stand at any given moment and provides clear direction about what is needed in order to win,” Kelsey says.